Louisiana Data=Berlin wall— What do they have to hide? CREDO has produced new research on charters in Louisiana. Looks like they want to disavow themselves of their prior claims about the poor performance charters relative to neighborhood schools— only 15% of charters in 16 states performed better than the neighborhood public schools. This time they have published a study on Louisiana charters. CREDO just happens to have exclusive access to Louisiana data as the state continues to REFUSE to release blinded data to ANYONE else besides CREDO. Well, that’s not totally true, I have heard that Doug Harris might also have the data. They have been in court 18 months for refusing to release data to researchers that they have not hand picked. Myself included incidentally. 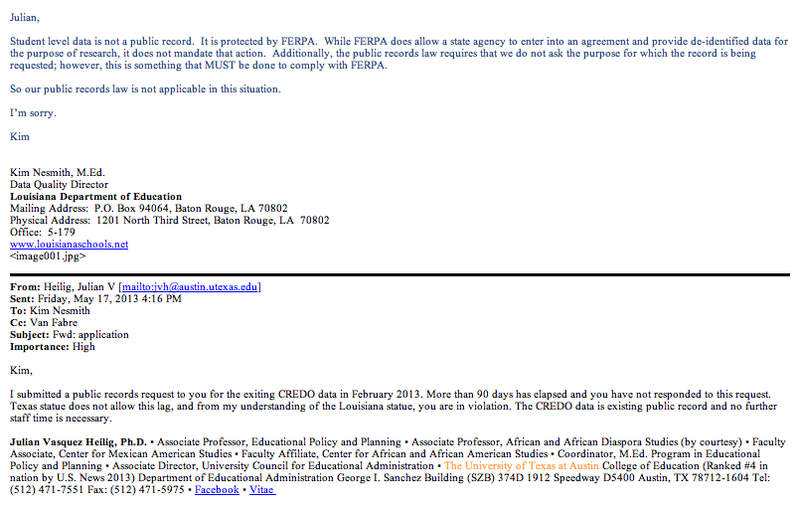 I asked Louisiana for their charter data for 12 months. They refused. What do they have to hide?— see LA and the Recovery School District approach (SB1718): A P.T. Barnum Circus). The Louisiana Department of Education has likewise refused to release this data to any non-pro-charter front organizations to conduct true independent research (they have been fighting the release of this data in the courts for the last 18 months), but this has not prevented newspapers from pushing this propaganda paid for by the Walton’s as independent research. If I was a journalist I would be ashamed that I allowed myself to be fooled by such an easy thing to research and such a glaring conflict of interests. See also New Orleans Graduation Rate – Miracle . . . or Make-believe? tagged with Data, New Orleans, NOLA, Tear down the wall!